You need to win your home games: it’s one of those football cliches that is a cliche because it tends to be true at both ends of the table. If you want to win the title, invariably it will be great home form that is the bedrock on which your title is won. And if you want to avoid relegation, it will be winning at home rather than away that typically earns you the vital points. There are huge contrasts in the home league fortunes of the 46 clubs who have played Premier League football since England’s top division was revamped in 1992. Our first graphic today illustrates that, breaking those clubs up into current 20 and the former 26. In the Premier League era to date, there have been 8,386 games and therefore 8,386 home teams, with the home side winning on 3,882 occasions (or 46.3 per cent of the time). Set against that average home win rate, Manchester United’s PL win ratio at Old Trafford is nothing short of astonishing: they have won 308 of 413 PL home games, or 74.6 per cent. Only five other clubs of the 46 have managed as many as 50 per cent wins at home in the PL era, while in the PL. Four of them are also still in the Premier League: Arsenal, Chelsea, Liverpool and Newcastle. One of them remains, for now, in the Championship: Leeds. It is notable that Tottenham’s 0-5 drubbing to Liverpool not only led to AVB’s departure, but it was a result that saw their all-time home PL win rate dip very slightly below the 50 per cent ratio. The home form of this season’s 20 clubs is also a story of contrasts. If home form is a key indicator then the title is a four-way race between Manchester City, Liverpool, Chelsea and Arsenal. 8 wins (100%): Man City. 7 wins (87.5%): Liverpool, Chelsea. 6 wins (75 %): Arsenal. 4 wins (50%): Newcastle, Southampton, Hull. 3 wins (37.5%): Tottenham, Man Utd, Stoke, Norwich, Cardiff, C Palace. 2 wins (25%): Swansea, Aston Villa, West Brom, West Ham, Fulham, Sunderland. The upshot: with 75 home wins this season from 160 PL games, the home win ratio of 46.9 per cent is very much in line with the all-time PL average of 46.3 per cent. It has been said that titles are won by winning home games and drawing away games so City are exactly in line for such an outcome with their 100 per cent home record and eight points from their eight games away. And what of this weekend’s games? 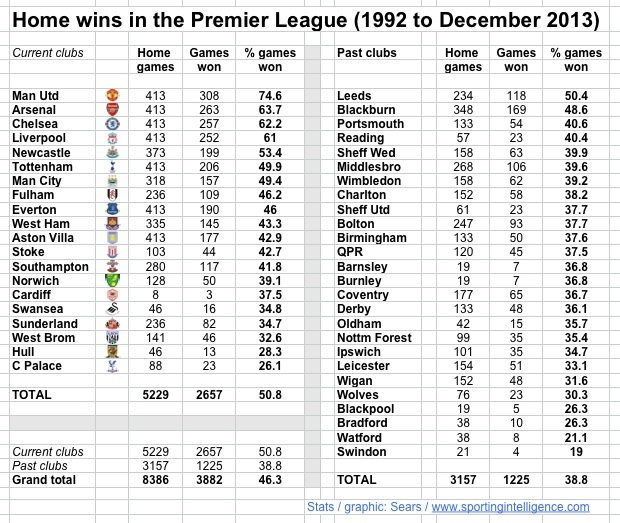 Here are the head-to-head home records in the PL era.